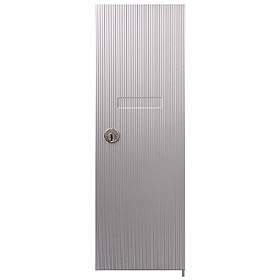 Question: What are the available finishes for the vertical mailbox door standard replacement? Answer: Aluminum, Brass, Bronze, Sandstone and Green finishes are available. Thank you. Question: I only need the long 16" spring hinge that is at the long side of the mailbox door. Is it available or do I have to buy the whole door? Do you have available list of parts? Answer: The hinge is attached to the door and help on to the frame by two hinge pins. If the hinge is the problem, a new door will be necessary.